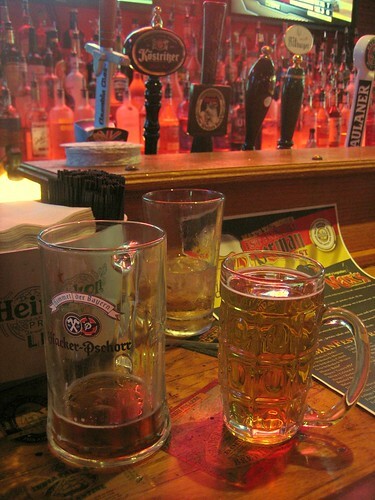 On right, mug of Reissdorf Koelsch, poured from a side-tapped keg. On left, Hacker-Pschorr Oktoberfest. Maxs TapHouse 1st Annual German Beer Fest. 50 German drafts, 100+ German bottles. Baltimore, Md. 12-14 September 2008. Photo and story by Yours For Good Fermentables.com.